The other cool thing about using a glass palette is that you can place any image you want BEHIND the glass. 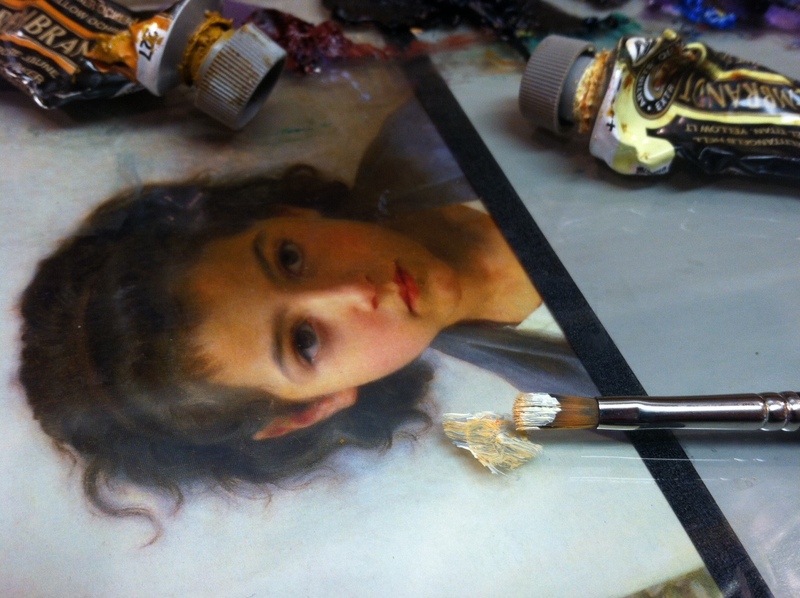 I tend to keep a neutral grey surface and a value scale there for reference, but you could just as easily place a classic Bouguereau painting and try to match the colors right on top of it! In addition to making a great palette, the scratch resistance of glass means you can also use it as a cutting surface. Though, blades do admittedly dull quickly when cutting on it, the trade off of having a large sturdy cutting surface is well worth it. By covering every surface I have in glass, it means I can work literally ANYWHERE in the studio. 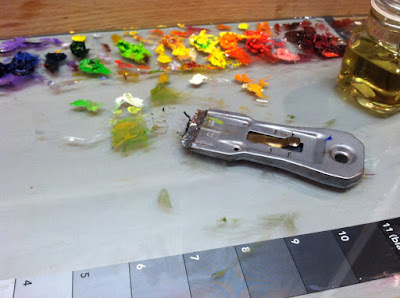 Every single surface can quickly become an impromptu cutting mat, palette, easel, gessoing table, or whatever whenever I need it. All without a single worry of damaging the surface beneath. This means I can work quickly, and MESSILY, without stopping to worry about protecting things around me. 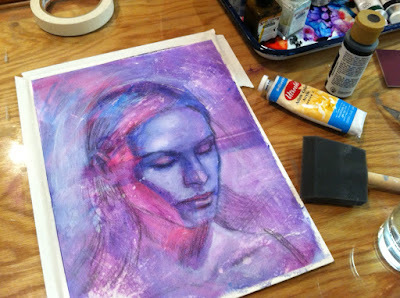 Tape, turpentine, cuts, spills, food, coffee mugs, dirty brushes... none of it matters. Everything can be scraped off later on. And best of all, it allows you to showcase the furniture beneath it. 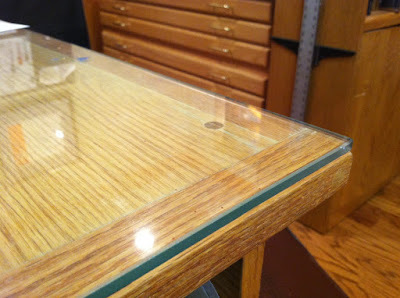 As a hobbyist wood worker, I love being able to see the beauty of oak furniture, while still protecting it from harm. If you're looking to do this to your studio as well, there a few things to keep in mind. Glass is relatively inexpensive, but varies according to type of glass you're purchasing. You can expect to cover a large 30x40 work surface for about $50 with the type of glass I use, which is about $3 a square foot. Most commercial applications of glass use what is called 'Tempered Glass'. Tempered Glass shatters into a million little pieces when it breaks, which prevents you from severing an artery on a large shard. And although this is great for windshields and coffee tables, you do not want to use it in your studio. Because the glass is covering a solid surface, there is little risk of falling through it and getting harmed. What you want, is 'Plate Glass'. Plate glass will crack into large manageable pieces if something should go wrong. 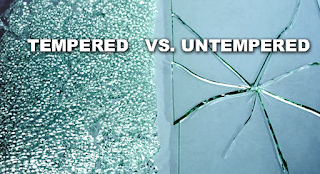 If you get a little over zealous with a clamp light or something, you might crack a corner off your glass, whereas tempered glass will explode right before your eyes and render the entire piece unusable. 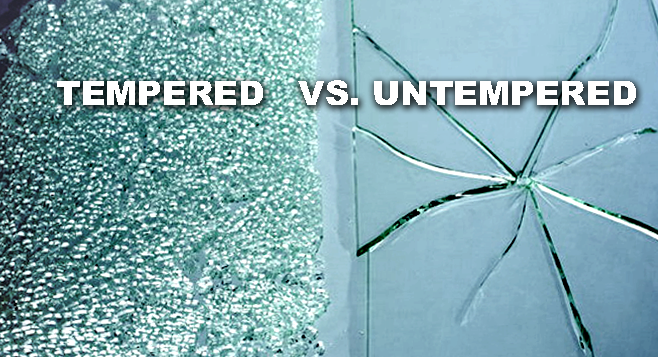 Tempered Glass is often called 'Safety Glass', and Plate Glass is often called 'Untempered'. I like to use 1/4 inch glass. Any thinner, and you run the risk of cracking it very easily. Any thicker, and you're adding a substantial, and unnecessary, amount of weight to your furniture. Glass edges are really sharp. They need to be polished. Many glass cutters will provide a basic, flat polish free of charge. But they may not, so be sure to take polishing into account when getting a quote. 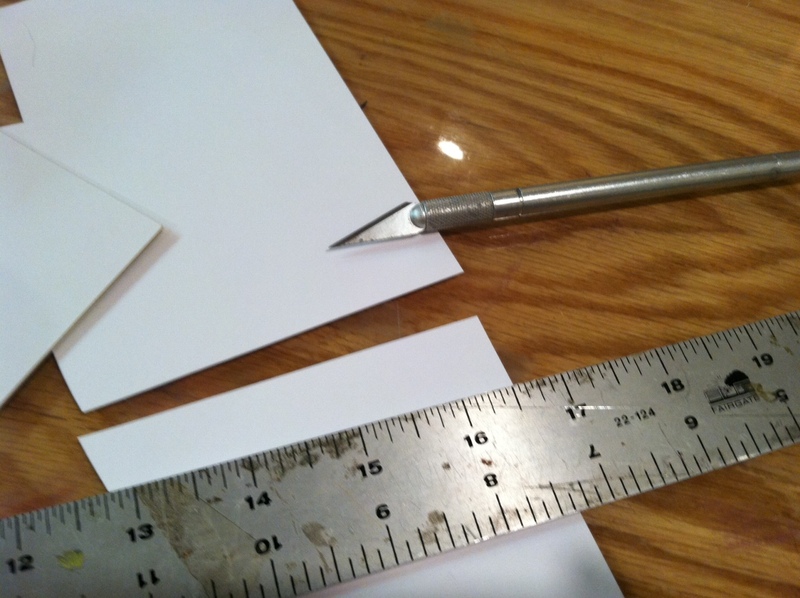 Many cutters will just polish the edge to the point of not being dangerous, and stop there. 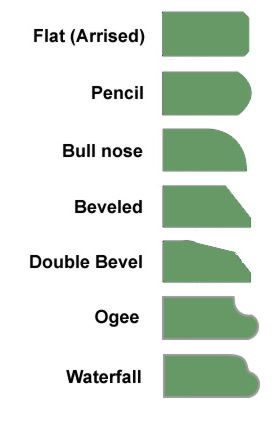 But because I spend so much time working in the studio, and am often leaning my arms against the edge of the table for long periods of time, I specifically request a really deep flat polish or what is called a 'Pencil Ground' edge. 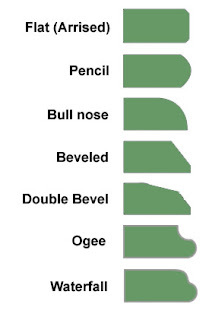 The pencil ground edge simply rounds out the whole side, though can be quite costly. In most cases, a good flat polish will suffice. I highly recommend finding a local provider for your glass. Although you can easily purchase it online at a discount, in my experience it is well worth the extra expense to go meet with an expert in person. My glass cutter was able to answer all of my questions, make recommendations, remembers the way I like it polished when I purchase new pieces, and has even given me great discounts on small pieces that served him little commercial purpose otherwise.